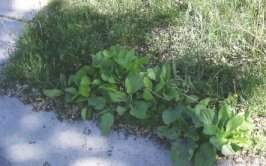 Usually seen as a weed, plantain can be found almost anywhere in Europe and the USA and in Canada, and I am sure it shows up in other countries as well. It grows in sun or shade equally and in dirt where most other plants won't grow. It is likely on your property right now, or alongside the sidewalks in your neighbourhood. It is possible that you have learned to know it by another name. Here are some other names used for this same herb; waybread, waybroad, cuckoo's bread, englishman's foot, white man's foot, buckhorn plantain, dog's ribs, hock cockle, rub grass, dooryard plantain, round-leaved plantain, broad-leafed plaintain, ripple grass, slan-lus, snakeweed. In some other languages it is known as (Anglo-Saxon) weybroed, Che Qian Zi (China), Breitwegerich (German), Tanchagem-maior (Portuguese), Llantén común (Spanish), Llantén major (Spanish). Do you recognize it now? It's botanical name is Plantago major (LINN) and it is said to be in the family of N.O. Plantaginaceae. For my purposes here, I will stick to plantain the rest of this page. European settlers brought this herb along when they settled in North America and in New Zealand and other places. Because it propagated fast, it got that nickname, Englishman's foot. This herb grows low, close to the ground with large oval leaves that have strong, elastic veins for ribs. These leaves grow in an ever larger spiral from the center. That's known as a rosette arrangement. If the soil is rich and there is plenty of sun the leaves can get to be about four inches wide, and at least six inches or more long. In the center of these rings of leaves grows a stock, maybe ten inches high, on which there are no flowers, but lots of little brown buds - the seeds. See, just by walking on these plants the buds get broken and spread around and the plant seems to thrive like a weed. Don't think of it as a weed any more though! You can use the leaves, the root and those seed spikes for your own good health! (Incidentally, this is not at all related to the banana-like fruit by the same name). My recent research uncovered that there are about 200 species in this herb family. In North America we are most likely to see Plantago major, with the wide roundish leaves, but there is another one around called, Plantago lanceolata, which has more narrow leaves, and it has a cone-cluster of flowers on the center seed stem. Both have good healing uses. 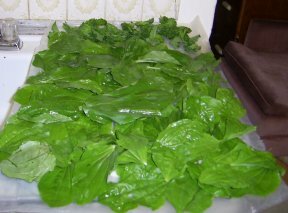 You can eat plantain as part of a salad, or steam it and use it instead of spinach. Mind you, as the summer progresses the leaves get a bit tough, so this salad idea works best in the spring with the young, smaller leaves. You can eat the flower-seed stocks raw or cooked. I haven't tried it yet, but just read recently that the seeds can be parched and added to foods where you want a slight nutty flavour, or you can grind them to a flour. Naturally, you can also dry and use the leaves, the seeds, and even the roots to make an herbal tea. I want to try roasting the seeds this summer, but I have tried it as a tea and an herb in a soup. If you want a tip from me, take it in small amounts. Too much too fast, and your gut may turn inside out to bow down to this great cleanser! If you have access to old recipes from the 1500's and the 1600's, you'll discover that Europeans included plantain in a lot of them. It was thought of as a remedy or cure for things from animal bites, to ulcers, ringworm, liver obstructions, (read gall stones? ), jaundice, epilepsy, and hemorrhoids. Even Chaucer and Shakespeare mentioned it as in common use. What exactly is in that stuff? Plantain is high in beta carotene (vitamin A), ascorbic acid (vitamin C), vitamin K and calcium. So far chemists have found it to also contain allantion, apigenin, aucubin, baicalein, linoleic acid, oleanolic acid, sorbitol, and tannin. That will explain why plantain seems to have an anti-inflammatory, antimicrobial, antihemorrhagic, and expectorant effect. Allantoin, for instance, promotes healing of wounds, cell regeneration and softens the skin too. 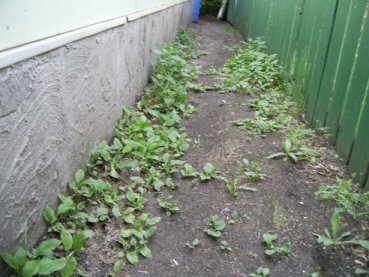 If you can only find it along public roads, where there might be some spraying to kill weeds, then I would just gather a handful of seeds and sow them in a garden or a container for on your balcony or a house plant pot. Wait until the new plants come up before you eat it. Current medical research is beginning to catch up with long-time knowledge of plantain. In Germany there is a Commission, similar to the USA's FDA, which regulates herbs and their uses. They have okayed plantain for internal use to deal with coughs and mucus infections, as well as for skin problems. Some Bulgarian tests indicate that is could be useful in treating bronchitis and asthma and other lung conditions. That Commission E in Germany recommends taking 1-3 grams (that's 1/4 to 1/2 a teaspoon) of the dried plantain leaves as a daily tea steeped in 1 cup of hot water. Do that up to three times a day. For some things you'll want to see instructions for making a tincture or syrup, or more simply, about a teaspoon full of chopped up leaves, and drop in a blender with your favourite juice. With a bit of experimenting you'll know how much is right for you. For external skin problems, wash a fresh leaf or two, and lay it over the dermatitis, or insect stings. (Think, how kind of God to grow them everywhere, so that when you get an insect bite, the remedy is usually close to where you are standing or walking!). If you have an open wound, crush the leaves a bit, so the green juices ooze out and come to the edges of the wound. This will slow down the flow of blood and heal the wound shut. Don't forget to look for the largest plantain leaves you can find when you have a sunburn. 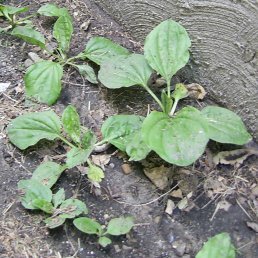 Wrinkle up the leaves to release the healing plantain juice and lay them over your raw burned skin. Make a plantain infusion by tossing a handful of the leaves in a cup or two of water and bring to a boil, then set aside to cool. Strain out the leaves and store your plaintain water in the fridge for a refreshing drink. If you should decide to try it with dried plantain, make sure you use much less. Remember that the ingredients have been concentrated with the drying. Incidentally, such lotions and creams, or salves are much safer to put on baby's rashy bottom than a lot of the chemical products out there. When you are really in a hurry, just wash a leaf well, and lay it inside the diaper. If you really like the results you get with this herb, you will soon be looking for and trying out other recipes for self-care products. The only side effect that some have reported is that they may have an allergy to the pollen from this plant. If that's the case, just be careful to avoid using the seeds, where the pollen is. Perhaps once you've used it a while your body may even be strengthend against all allergies. I need to be careful how much I dare quote from Back to Eden (by Jethro Kloss), but on pages 295 to 297 there are a number of simple methods to use plantain as a remedy for various things. For example, with erysipelas, eczema, burns, and scalds, it is pounded into a paste and applied to the wounds for a soothing, cooling and healing effect. It will check bleeding too. Kloss describes a tea to make for piles and hemorrhoids, and how to apply the tea. "For use in leucorrhoea," Kloss wrote, "make a strong tea and use as a douche with a whirling spray syringe." He claimed it is wonderful for diarrhea, kidney and bladder trouble, and aching in the lumbar regions and for bedwetting. There's more! He recommended plantain for scrofulous diseases and syphilis (internally and externally), as well as for poisonous insect and snake bites. Even boils, carbuncles, and tumors. As I've already said, my experience shows this to be a powerful herb. I try to dry and freeze some every summer so that I won't run out of plantain. In Maria Treben's book, Health through God's Pharmacy I've been reading how plantain has been honoured as a great remedy since Anglo Saxons talked like Chaucer. She tells of a farmer who injured his hand in the field, but rather than go for help, he just stooped to pick some plantain leaves and wrapped them around his hand. Though the leaves were dusty, they did not cause an infection, and his hand healed. Treben writes how one can keep blisters from forming on one's feet in a long walk by laying plantain leaves in the shoes. She also tells how she had said in a talk that this plant could even heal old wounds, 10 or more years old. Five months later, a woman who had heard her and been skeptical, met her again and reported how she had gone to a neighbour who had open sores on her foot for 17 years and was unable to go outside any more; she had applied plantain leaves as Maria Treben had discribed, and to everyone's astonishment the old sores healed up. Nor had they re-opened. Doesn't that just make you want to try your own tests? Infusion: One heaped teaspoon of leaves to 1/4 litre of boiling water, infused for a short time. Tea mixture: Equal proportions of plantain and thyme are mixed, 1 teaspoon to 1/4 litre of boiling water. I dry the leaves and crush them and put them into a tea ball. Then hang it in a teapot and poor boiling water over it and let it steep about 5 to 10 minutes. However, since herbs are more powerful when dried, it is smart to use a bit less. Stuffing the tea ball full of just plantain is not wise, but when I've felt rotten with a flu, I have put an assortment of herbs in it, a pinch or teaspoon of each, and usually feel much better by the next day. I've just discovered a delightful herbal book written and illustrated for children. You should go have a look at some of the pages too. Another site has a recipe using both calendula and plantain for a lip balm. While I have Maria Treben's earlier book, "God's Pharmacy", I have found online that she has a newer edition out now called, "HeaHealth from God's Garden" I was pleased to find more sites in which Maria Treben shares her knowledge of many herbs and herbal remedies Here's her plantain page. Herbs are God's Phamarcy for our Health! I promise to use it only to send you Aloe Vera Tips & Solutions. Every first-aid kit should have some aloe vera for skin care. Order the lotions, ointments or sprays that you prefer. If in the USA or if in Canada (Same products, just more convenient locations). Every first-aid kit should have some spray on aloe vera for cuts and sunburns. If in the USA or if in Canada (Same products, just more convenient locations).